Paul Daniels (6th April 1938 - 17th March 2016). Paul Daniels started out performing in working men's clubs where he honed his quick-witted ad-libs and brilliant magic routines to perfection. He made his TV debut on ITV's talent show Opportunity Knocks, but it was really his three appearances on The Wheeltappers and Shunters Social Club YouTube in 1975 and 1976 that shot him to fame nationwide. This led on to him ultimately having his own BBC series The Paul Daniels Magic Show, which ran for 15 years; dominating the British magic scene throughout the 80s and early 90s. He also enjoyed great success in London's West End, starring in his own show It's Magic at the Prince of Wales Theatre, from December 1980 to February 1982, and was by then working with his future wife, Debbie McGee. Debbie, a trained ballet dancer, had first worked with Paul on his summer season in Great Yarmouth in 1979. My personal memories of early Paul Daniels and the super-talent that he was will always remain vivid. I was lucky enough to have seen him live, in what I consider to be his best performing period, and natural habitat, when he appeared at a night club in Bournemouth on September 9th, 1975. 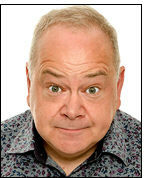 I'd seen him on TV on The Wheeltappers and Shunters Social Club and also on the BBC magic series For My Next Trick which ran in the summer of 1975, so couldn't wait to actually see his full club act live. I went with school friend John Rogers and kept the flyer, on the left, as a souvenir. Daniels was incredible! He must have done about 40 minutes. From memory he performed the Chop Cup (that should read his Chop Cup, as no other magician ever came close), borrowed Banknote in Walnut, in Egg, in Lemon, Electric Chairs and more. There was a real underlying charm and playfulness and sense of fun throughout his whole performance, combined with cheeky one-liners and, at that time, just the right level of confidence and command... you knew you were watching the very best. He had an instant ad-lib for everything, everyone, and every situation, and his comic timing was perfect. His magic timing was perfect. His choice of magic was perfect. He was simply brilliant! A bit like a band's first album, I think those early years were pretty much unsurpassable. Little did I know that 30 years on I'd be appearing, with my wife Keiko, on his show, The Paul Daniels Show: Encore! - a special one-off gala that John Fisher had produced as part of The Magic Circle Centenary Celebration Convention held in London in July 2005. Paul Daniels was once again very much on form and it was a great night. "'Our life was full of laughter until the last 48 hours when he slipped into sleep': Paul Daniels's tearful wife Debbie McGee reveals he spent his final days eating his favourite Magnum ice creams and singing Beatles songs" www.dailymail.co.uk. "Steve Allen's Touching Tribute To Paul Daniels" www.lbc.co.uk. "Paul Daniels' best clips, from the Iron Maiden to disappearing elephants" www.theguardian.com. "Paul Daniels: David Copperfield pays tribute to the late magician" www.express.co.uk. "Paul Daniels: Debbie McGee says their lives were full of laughter" www.bbc.co.uk. "Dynamo: Paul Daniels was 'first working class magician' to make it and a 'master'" www.bbc.co.uk. "TV magician Paul Daniels dies aged 77" www.itv.com. "Paul Daniels – an accomplished trickster who was not hiding anything from the public" www.theguardian.com. "Dynamo: 'Paul Daniels was the godfather of magic'" www.bigissue.com. 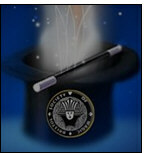 "Other magicians did tricks – Paul Daniels performed magic" www.theguardian.com. Chris Cross announces a Paul Daniels Charity Magic Show. From the organisers: Just before the legendary magician and showman passed away, Daniels set-up his own charity page to raise money towards Brain Tumour Research.Org and three other charities, aiming to raise a total of £100,000. This final charitable gesture to help bring smiles to people's faces will be part of his legacy. On Thursday 19th May Chris Cross had booked Paul Daniels & The Lovely Debbie McGee to perform at his Quayside Cabaret Club at Prima Pizza Pasta in Newcastle City Centre, but that sadly got cancelled due to Paul's battle against cancer. Just nine months ago, Paul Daniels, Debbie McGee and Chris Cross performed to a Sold Out audience in the same venue. 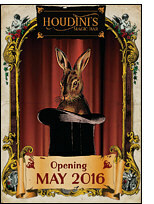 We are still putting on a show on that date, as a tribute to Paul Daniels. Chris said ''It's such a sad time at the moment and my thoughts are especially with Debbie, Martin, Gary and Paul Jnr. I will treasure the memories of performing alongside one of my heroes last year at my Cabaret Club. Putting on a show to raise some money for his charity is the least I can do. 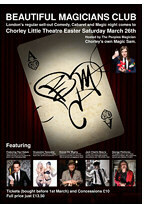 The evening will be compered by fellow magician John Archer. John was a member of the Middlesbrough Circle of Magicians with Daniels in the early days and has performed with him on numerous occasions around the country. More acts are being confirmed for the evening, which promises to be a magical evening of comedy and trickery, with a few Paul Daniels stories too!